This piece comes from the latest number of the printed edition of SNIPE. Which was last spring. Please align your timepieces accordingly. Greenpeace recently made the news for shutting down many of BP’s London petrol stations. The action was aimed at highlighting Shell’s plans to drill for oil in the Arctic . One Saturday, I received an email from a Greenpeace mail-out asking people to join them on a peaceful protest outside a Southwark Shell station. At the time I was sitting on my bed slightly hung-over and eating stale custard creams, so going to join the protest seemed like a better use of my time. It was there I met the protest organiser, Abigail, a volunteer Greenpeace activist and campaigner. Snipe: How and why did you become involved in Greenpeace? Abigail: I became involved after finishing my bachelor’s degree in Ethics. I went from thinking that our human problems like poverty and conflict were the most important things, to realising that environmental problems were just as huge and that actually that they were bigger and that everything else depended on those. S: On a personal level why do you think you’ve chosen to engage with these global issues rather than live a more blinkered life, was it important to you growing up? A: I think some people are just more like that in their nature, some people are just more attuned to the more serious side of life. I guess I know that I always have been. I just remember travelling with my Dad when I was little and seeing real poverty – the kind of thing that as a normal English girl you wouldn’t have seen at that stage. S: Where did you see that? A: In Nairobi, in Kenya , He took me when I was about six, and we walked down a street and I saw these kids begging on a corner and they were younger than me and I think that had a really profound impact on my ideas about what was right and wrong. As a child your not always thinking about it but suddenly your standing there with other children who don’t have sandals on and don’t have anything and they were asking my Dad for help. I think that’s partly where it came from. It was probably pretty momentous actually in my life. S: Do you find it frustrating that Greenpeace activists are often perceived as hippy-like protesters on the fringes of society and do you feel that perception impedes your progress? A: I think it can do, most people I get to speak to face to face I’d say no, but I think it’s one of the things that’s holding the Green Movement back, it’s still perceived as being something for these fuzzy, hippie, tree hugger people to do and they don’t realise that we need people fighting for things like the Arctic Campaign you’ve met me on. It’s about all of us. It’s not something that’s a million miles away and we’re just being nice and caring about the Polar Bears and whether or not they die – it’s about climate change, it’s about human deaths too and that’s already affecting us. Look at this bizarre weather we’ve been having. People do come and talk to you and they start to realise otherwise.. but there still is some kind of stigma in some people’s mind. I just find it bizarre, really strange. S: Can you explain what you do in Greenpeace and how you operate in the organisation? A: I’m a volunteer activist and campaigner, so everything I do is completely voluntary, which I think a lot of people don’t realise. A lot of people see you on the street doing some kind of campaigning and they yell things like “get a job” or things like that, which is quite an odd thing, because you met me on a Saturday when I was giving up my free time, with other people doing things that they care about. S: That must be frustrating. A: People like that are not there to listen to a response, but normally, I just tell them – it’s a Saturday, this is my free time. S: Thinking of the more direct action protests where Greenpeace members have been arrested for cutting off pumps – at what point do you think it’s right to go beyond the completely passive protest to the more action based protest? A: In terms of the action against Shell, you’ve got a company doing what should be described as criminal damage. The things that their doing shouldn’t be, and I don’t think they are, legal. Not only with drilling in the Arctic but also damage that they’ve done in other areas. The mindset in Greenpeace with the activists is that they’ve written letters, they’ve met them, they’ve phoned them, they’ve petitioned them, they’ve protested and there’s no response. Sometimes you need to take things to another level and you have to give someone a bit more of a sting to remind them that you’re still there and you’re still fighting against it. I grew up as a good girl. knowing that breaking the law was the wrong thing to do and things like that, but since I’ve learned more about Civil Disobedience I’ve realised how important it is in any social movement, You know, Gandhi’s salt marches were an act of civil disobedience – they broke the law, a law in that case, that they identified as meaningless. The Apartheid struggle – there was a lot of breaking laws that they couldn’t identify with, that they saw as wrong. Now shutting down a Shell Station, it’s not exactly the same, but it’s taking a message that step further and when you’ve identified a company that will not listen to you. S: So you feel that society has a moral obligation to stand up for things even if they are not achievable? A: Absolutely, so Shell are supposed to start drilling in the Arctic this week, but they haven’t because of their ship running aground, I think you have to stand up for things, if you don’t nothing will ever change and OK, so we might be facing a huge oil giant and they are already in the Arctic, they are already waiting, but the least empowering thing to do would be to turn your back and say – OK I can’t do anything – that will never help us to change anything at all. All of the social changes in our history have relied on people saying – no I’m going to stand up to this – even in the face of odds that they felt were absolutely impossible, so I think it’s vital. S: What would you want to say to people in London if you were to try to persuade them to get involved? A: It’s time to stop seeing the environment as an issue to be left to a few people who ‘like trees’ etc. We have to realise the environment is an issue for all of us – it’s a human issue that is affecting every one of us and is going to have a devastating impact on our future – for that reason it’s time to stand up and be counted and to get involved. One of the things is people don’t realise they can volunteer. Until I got involved I didn’t realise there is a local group you can join, where you’re not pushed into anything. 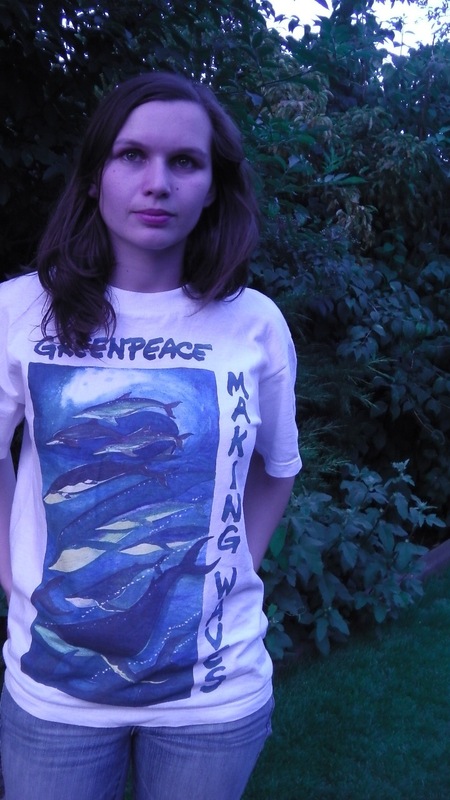 If you agree with Abigale, you can find more information on Greenpeace activities here.